The scenario of the Euro Area is characterized by three features: weak and uneven growth, high liquidity supported by unconventional monetary measures, and a new supervisory architecture in the financial sector. In this context, which are the perspectives for the Italian Banks in the European arena? The 20th Report on the Financial System investigates key issues using three different perspectives: micro, macro and regulatory views. 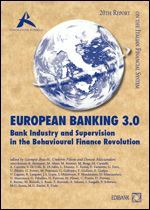 Part One “Behavioural money and banking” analyses the approach of Behavioural Economics (Be) to explore the banking and financial choices and to evaluate the appropriateness of different supervisory styles. Be (and also Neuroeconomics)allows us to observe phenomena from a different perspective and give us unusual and original instruments to make diagnoses. Also, thanks to their typical and experimental approach, studies that adopt these perspectives often can suggest solutions that have specific but substantial policy implications. The papers in this section are a typical example of both the potential and the limits of this approach. They refer to specific and diversified issues but, leveraging on the objective observation of behaviours, they contain immediate and realistic policy proposals. In the Part Two “Bank industry” the Report illustrates updated aggregate evaluations of the health state of the Italian banks. The long financial crisis has widely impacted the European banking system, opening the debate on the efficiency and sustainability of different bank business models. In the early stages of the crisis, the banking system of countries, like Italy, in which the retail commercial bank model prevails, appeared to demonstrate greater resilience. However, in these same countries, with the severe downturn of their economic conditions, banks have subsequently revealed more critical areas: an important indicator is the sharp decline in profitability, that has been amplified by the new and more rigorous framework concerning banks regulatory capital, making it essential to rebalance costs and revenues and reconsider growth strategies. Finally, the crucial and evolving effects of the new single supervisory architecture on the banking setting are analysed in the Part Three “Bank supervision”. The architecture of the Banking Union has been constructed on the two pillars entrusted to different authorities: the Single Supervisory Mechanism (Ssm), and the Single Resolution Mechanism (Srm) with the Single Bank Resolution Fund. The Banking Union has been strengthened with a considerable complexity of actors and procedures; however, the central role is played by the strong direction of supervision by the Ecb. 3. Why do we prefer raw figures to percentages? CAN HIGH QUALITY INDEPENDENT DIRECTORS REDUCE CEO OVERCONFIDENCE?